Been amazing! Handling is much better and fuel consumption seems to be better! Tend to spin up when cold but warm up quickly(Big single torque you know!). 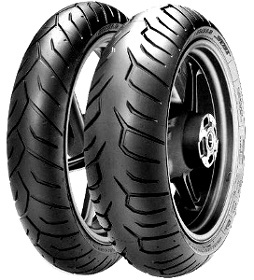 I needed a rear tyre to match the new front tyre which had been recently to the bike when I bought it.Although the Pirelli is not dual compound it is lasting better than expected possibly as its fitted to a comparatively low powered twin used solo and only for pleasure,no commuting [and no wet roads]For the price it is a good buy.